If you are tired of driving around with low quality factory branded speakers, this is the review for you. Get rid of the idea that you are forced to listen to the rattling, watered-down speaker system that has been plaguing you. Now, you can enjoy your commute to work and your road trips with your friends. Learn to savor the magic of high quality speaker systems at an affordable price. In this article, you will learn of two of the very best 4 x 10 alternative speaker systems that you can buy at an affordable rate. How good is the bass? Will this work fit in the backside panels of my vehicle? What are the pros and cons of a higher max watt? Do the speakers have covers? These speakers truly cover you from top to bottom when it comes to delivering an alternative form of audio performance, without having to worry about missing your next car payment. These Boss Audio speakers come with a punch, and are able to effectively deliver the sound quality that you deserve. The speakers are capable of handling 400 watts per pair and 200 watts each. We recommend that the power range is 10-80 watts RMS per channel. The speakers come with a magnet structure of 20oz that provide the system with an ability to truly “bounce” with the beat the way the music was intended. The speakers come with metallic poly injected cones that are capable of optimizing sound quality. The system also comes with rubber surrounds, which provide you with the ability to listen to the music for extended periods of time without having to worry about the speakers falling apart or breaking down with overuse. You’ll see that they come with customized plastic grills, which look great while also being extremely affordable. With these speakers, you’ll benefit from a customized interior finish, without having the budget of a celebrity. Perfect Size- these speakers offer a perfect blend of size and power. Many people feel that large speakers are too expensive or have a bass that is too powerful, while others have complained that 3.5 speakers simply don’t deliver the sound finish that they are looking for with an alternative system. With these 4 x 10 speakers, you’ll find that they are the perfect fit to deliver the high quality sound that you need. Three Year Warranty- after reviewing plenty of speakers, we have seen that warranties come generally under two classes, one year and three years. When you see a company that can confidently make a three-year warranty, you can see and understand that the quality of materials used are of a much higher caliber. This should give you the confidence moving forward, knowing that this is a sound investment that will keep you satisfied for an extended period of time. You’ve been driving around your car and realize that the sound system isn’t as impressive as it should be. Don’t fret, though, as this is the case with most low and medium-priced vehicles. 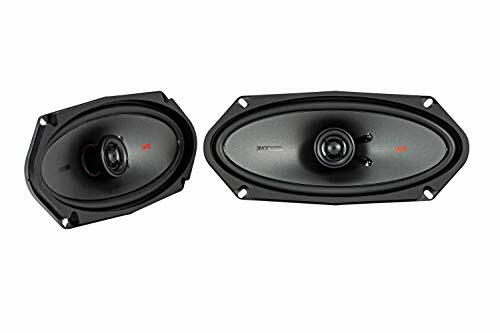 Indeed, most factory installed sound systems are of mediocre quality, and the only option you have as a music enthusiast is to simply go for aftermarket car speakers to enhance the overall audio quality. Souping up your car audio speaker doesn’t have to be an expensive affair after all, contrary to common perception. When making the decision, however, you need to be well informed, which is why we are here to guide you down the proper path. 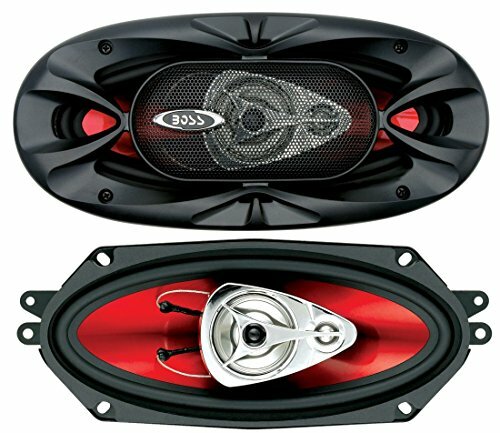 Give your car stylish audio at an affordable price with the Boss Chaos extreme series. These full-range speakers feature red metallic poly-injected cones and polymide dome tweeters, to create intense highs and absolutely clear lows. The red metallic finish accents any interior and the impressive power handling delivers a sound experience that is clearly above the rest. No, these are not marine speakers. They are, however, highly durable and will confidently deliver you the long term quality services that you are looking for when making the purchase. The bass is very deep and vibrating, and you will feel every tone to the depths of your soul when listening to your favorite songs. These speakers truly pack power into their punch. Yes, these speakers are highly flexible, and they can fit in your front, back and dashboard speakers. Higher watt ratings give you better, fuller sound quality, if you have a receiver or amplifier that is powerful enough to drive speakers with the higher watt rating. If your amplifier has a sustainability lower wattage output, then there won’t be enough power to drive the speakers, resulting in poor sound quality. This would be an example where buying more expensive speakers does not automatically mean better sound. Do not buy 100-watt speakers unless you have an amplifier that puts out at least 50 watts, but not more than 100 watts per channel. In that example, an amplifier puts out more than 100 watts, and that would eventually blow your speakers. Generally speaking, 4 x 10 speakers are designed to act as all-rounded audio components, which can effectively produce decent low frequencies, impressive highs and exceptional midrange frequencies. However, finding a high-quality speaker of this size can prove to be a huge challenge, compared to the rest, more so for first timers. The answer is simple, purchase the Boss Audio CH4300 4 x 10 speaker system. Upgrade the value of your vehicle. Learn to enjoy going out for a Sunday stroll and look forward to inviting your friends to take the ride with you. You will be pleased and guaranteed to enjoy your purchasing decision with the Boss Ch4330 units. The KSC speakers deliver unmatched quality in design and functionality. The best part of the product is the fact that it is simple and very easy to control. The design and layout is really a fantastic display of craftsmanship which makes the entire system look beautiful. These are speakers that are truly going to solve your low-quality sound problem, once and for all. Best of all, when you buy them, you won’t feel like you are in position to be missing this month’s car payment, as they are one hundred percent affordable. These speakers are built for awesome sound that rocks all day long. They are built for high power handling and extended dynamic range. These speakers come with silk dome tweeters that effectively deliver a smooth sound, and they also come with polpyopylene woofers and tough rubber surrounds that allow the system to work long periods of time. The system comes with a thin-mount design, which easily fits behind factory grilles, meaning you won’t have to completely revamp your entire interior just to install this new sound system. The KSC speakers work best with 75 watts of recommended power. Many people feel attracted by the visual appeal of these speakers, in addition to its use. It was developed to meet the needs of people, and it is an extraordinary product, ideal for simple configuration, maintenance and control. High Power Handling- if you are one that really likes to “pump that bass” when you’re driving through the neighborhood, these are the speakers for you. Want to attract some new friends while waiting at a stop light? Then these speakers are an absolute no-brainer. Use these speakers to pump up the volume on the way to having a great time. Efficient- not only do these speakers have a magnificent way of delivering high quality sound, but thankfully, they do not consume a large amount of power, meaning the speakers are built to last for longer periods of time. Polypropylene Woofer Cone- the design allows the system to improve sensitivity while also reducing distortion. You’ll be happy to hear the fine details of every song you listen to, guaranteed. Everyone can use the Kicker KSC speakers and execute them by following some very simple steps. The great thing about this product is the fact that it has extraordinary function and is easily available in various shapes and sizes. Everyone can appreciate the magical work of the features, and can confidently crank the speakers knowing that it will work properly when they need it. Something to notice from the product is flexibility and functionality, that can make life more enjoyable and comfortable. It is better than the old product that you are used to (factory stock), and you will feel satisfied with this product that’s affordably priced. It’ll be like you are listening to music for the very first time. The design is very light, attractive and elegant, with the latest innovation. This product is able to meet all the expectations of users with functions that are easy to use. You will be amazed by the sheer volume and depth that comes from these little highly affordable speakers. Trust me when we tell you that worrying about your bass will be the least of your problems after making this purchase. Installation is simple and easy, thankfully the system comes with directions that provide you with step by step direction regarding how to effectively get your system installed. If you have any trouble, you can easily go to a local Geek Squad or mechanic that will take care of the product for you. Yes, the speakers have covers, but can also effectively fit under your factory branded grilles. Either way, you will be left with a high-quality sound that will be certain to change the way that you experience your music. You have to love a perfectly crafted song while leveraging high quality technology. If you had to pick a pair of affordable car speakers to handle the harmonies and pristine production of quality music, Kicker’s KS speakers are an excellent choice. The polypropylene woofer comes with a very powerful magnet which delivers you an impressive punch. The ½ silk balanced dome tweeter delivers every ounce of smoothness you’d want in your music’s vocal and instrumental details. Your favorite music will gain a level of dimension that factory speakers simply cannot manage. With the KS series Kicker, the company has created a high sensitive design that conjures hefty volume even from low powered factory radios. Get ready to finally upgrade your audio experience, once and for all, with the Kicker KSC4 speaker system. For the price, you will be delivered unmatched quality, guaranteed. Do yourself a favor, and install a speaker system into your vehicle that you can be proud of. Soon, you will look forward to long commutes and being stuck in traffic.